Comfort Hair™ Rinse Free Shampoo Cap with Conditioner is the first complete, one-step hair care system in a convenient, microwavable cap. By eliminating the need to rinse, we’ve eliminated the mess. Now you can thoroughly clean and condition your patient’s hair without the sloppy rinsette full of water, or moving the patient to a water source. No need to gather multiple supplies. No lengthy cleanup. And no need to change wet bed linens or patient clothing. It’s the easiest hair care ever! 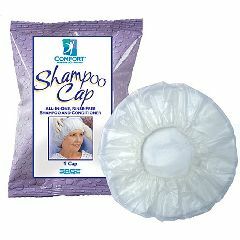 Comfort Hair™ Rinse Free Shampoo Cap replaces shampoos, conditioners, rinsettes and other costly items. This product is for a one time use only. Bought theses for son stationed in Afghanistan. They're limited on water usage. He just loves these uses everyday. Safe. loveit.. lloveit. easyl. easyl. when I am away from home. when I am away from home. I use it cause I am not able to stand up to ka sink to wash my hair. It is quick and easy to use. I love everything about it it ready gets your hair clean if you use it the right way. My wife is bedridden most of the time. Safe. Lightweight. Sturdy. Functional. Easy To Install. I can't find them locally. I can't find them locally. Nurses didn't know . I use it to wash my wife's hair. convenient easy to use product. Because I am limited mobility wise, this product has made it much easier on me and my care giver to keep my hair clean. Recently I had a catastrophe that caused us to have no water to our home for 2 weeks. Because of the scramble we had to find places to bathe and wash hair, I thought I would try one of these to see how it might work if something similar happens again. As it turns out, this product did not work well for me. I can't say it did nothing, and it might be better than nothing, but it did not clean my hair well, had a drying effect, and left a kind of coating on my hair. I have long hair, so it is possible that people with shorter hair would have better results. I bought a couple of different brands, so I will review those as I try them. I say that I would recommend them to a friend because it may work better for someone with short or shorter hair.